Marcus Pollard, Robin Hamer, Gajarajan Sivayogan and Wen Gu have developed a proposal that aims to save money and time by ensuring predictive maintenance of tablet-making machinery. The UK subsidiary of global Connectivity and Networks component manufacturing specialist HARTING challenged the students to suggest potential applications for their new product MICA. MICA (Modular Industry Computing Architecture) is an edge computing device that can be digitally retrofitted into existing production facilities as a direct interface to machines. It provides a bridge between machines and cloud-computing and can be immediately and securely integrated into a production environment for minimal cost, providing continuous data processing and condition monitoring analysis of key operating processes. The students decided to focus on a pharmaceutical application after being inspired by Marcus’ placement year at a British multinational consumer goods company. They decided to focus on tablet presses as they are one of the most common pieces of equipment in a pharmaceutical manufacturing environment. They work by filling a hole – known as a ‘die’ – with a powder and this powder is compressed by two metal punches to form a tablet. Tablet presses used in manufacturing continuously use multiple dies and punches – collectively known as ‘toolings’ – to achieve high output. Some tablet presses can produce 229,500 tablets per hour with 32 sets of toolings and, as a result, these punches are under continuous wear and are prone to breakages. Breakages mean that the tablet press needs to be stopped for maintenance, which costs money. Breakages of the punches could also lead to metal fragments being deposited in the tablet batch, which means the whole batch would need to be disposed of as it would be unsafe. The Loughborough students’ came up with the idea of tracking the use of these punches and dies via RFID (radio-frequency identification) tags on the tooling that would be scanned by MICA and recorded in a database. By tagging the tooling and tracking the number of tablets a machine has produced, the wear on the tooling could be continuously monitored so that when this hits a critical point it can alert a staff member via email. It would let them know that a particular piece of tooling has reached its pre-defined end of operational life and needs replacing, giving its location to allow for minimum downtime. The proposal also suggests that the tags on the tooling could store information on which machines had used the tooling, which operators had used the tooling, the length of its current life and how many of a particular tooling is in stock. Howard Forryan, Product Market Specialist at HARTING, said: “HARTING were very impressed by how quickly the students were able to understand the main operating concepts of the MICA edge computing device. “For example how best to programme it and download the most appropriate software from HARTING’s online stored range of “Open software” development containers, in accordance with the application requirements. This work was conducted as part of our industrial group project scheme, which runs twice a year. If you want to know more about the scheme or our industry-relevant PhD programme and the options available to collaborate contact us. Jake Rankin from Cohort 4 gives us a description of the conference he recently attended which was hosted by ADAS dSPACE and Warwick Manufacturing Group (WMG) at Warwick University entitled 'The State of the Art for Developing and Testing Advanced Drive Assist Systems'. After an introduction, Dr Phillip Clarke discussed autonomous vehicle testing methods, in particular Hardware in the Loop (HiL) testing. HiL is a key means of being able to increase both the volume and range of testing, working closely with ISO 26262, dSPACE use a combination of Automotive Simulation Models (ASM) and Virtual Validation (Left-Shifting) to help further train simulations. The purpose of the conference was to discuss how this method was implemented and why it was useful. Typically, two methods of testing are used. Open-loop testing is used to check the performance of the algorithm and closed-loop testing is similar but with the addition of a simulation model that gives feedback. HiL is a type of closed loop testing which both records and analyses simulations and feeds real sensors data to see how the simulated models work. Some of the tools included a radar test chamber which contained a radar in a circular chamber with movable rings that emit acoustics to mimic distance. Testing can be done even before a CAN setup is used to just test the algorithms, which is called left-shifting. dSPACE use a system called VEOS to test the model behaviour. Rapid control prototyping of machine algorithms was the next discussion and firstly focused on the basics of sensor/actuation interaction. In particular, it discussed the means of applying neural networks and deep-learning into an actual system by first developing and training the learner with Tensorflow, with the help of SLAM algorithms. Next, Nvidia hardware such as the Jetson X2 is used to optimise the learning algorithm and the algorithm is finally places into dSPACE’s MicroAutoBox II. The system was shown to be very flexible in terms of coding languages that it can accept as well as other off-shelf programs such as MATLab. WMG’s Graham Lee then gave an overview of the facilities at Warwick University, part of the CATAPULT group and Innovate UK. Currently, Warwick are finalising their NAIC building which will also give MSc courses on autonomous vehicles; the first in the country. The main project that Graham was working on was a system called SAVVY. This is a project which hopes to develop scalable AI testing, using some of the aforementioned equipment from dSPACE. Finally, Torten Kluge gave a talk on scenario-based testing and sensor simulation. One of the challenges was acquiring data and dSPACE were able to collect a lot of their data from GIDAS, which are accident studies in Germany. These scenarios would then be uploaded into the simulation, with additional input from services such as SUMO (a traffic-flow simulator). All of this was demonstrated with dSPACE’s simulation which included all of the sensor data, car behaviours and states. Because of the simulation design, even with critical components such as the ECU and sensors, the simulation could still be tested. Overall, it was a very interesting insight into autonomous vehicles and certainly resulted in useful subjects to research for vehicle autonomy. https://www.dspace.com/en/inc/home/applicationfields/our_solutions_for/driver_assistance_systems.cfm for more information. Cohort 3 researcher Orange Gao was invited to be a main stage presenter at Teesside Digital Forensics Conference (TDFCon 2018), a student-led international conference for computer and digital forensics students at Teesside University. The theme for conference this year was ‘Resilient and Secure Societies’ and focussed on understanding and developing responses to the complex range of inter-related global processes that create risk and threaten the physical and emotional security of individuals, communities and societies. Attendees included students, academics, practitioners, police officers from local forces, and some government agency/civil service employees. Orange spoke about artificial intelligence from the perspective of computer vision and related it to digital forensics. She described her recent work using recent advances in deep learning technology to generate images from verbal descriptions for accurate facial composites in criminal investigations. This novel approach reduces subjectivity in decision making and increase law enforcement response times. Matt Smith from Cohort 4 describes his recent visit to the Ergonomics & Human Factors Conference. The purpose of this event was to bring together PhD students with human factors and ergonomics projects and go through different part of a PhD including writing techniques, planning and procrastinations. Each of the 11 attendees had to give a ten-minute presentation on their research and progress and were asked engaging and relevant questions afterwards. I created a presentation that covered my progress so far including a breakdown of the design methods I intended to use, visuals that I had generated from data gleaned from my semi-structured systematic literature review and the current work I am doing around the wearables which I am looking to design. My presentation won the prize for ‘most ascetical presentation’ earning me a signed copy of Introduction to Human Factors and Ergonomics, Fourth Edition by Robert Bridger and a cap. I received advice regarding previous works I should study and was asked questions about how I was planning to conduct my first study with critical design pieces. The majority of the participants were human factors researchers with backgrounds in psychology. This included several participants from Nottingham University currently engaged in pursuing research relating to transport and one individual from Sweden who was studying wearables in personal lighting plans. I was the only attendee with a background in design. 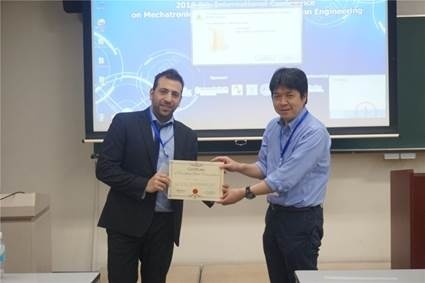 The 3rd International Conference on Control and Robotics Engineering, ICCRE 2018, was held at the Nagoya Institute of Technology, Nagoya, Japan through April 20th-23rd, 2018. The aim as well as the objective of ICCRE 2018 is to present the latest research and results of scientists related to Control and Robotics Engineering topics. Christos Kouppas (cohort 3) attended to present his preliminary results on his PhD and his algorithms. The conference started with the enrolment day and the first meet up of the attendees. The main conference was held for two days (21st and 22nd). The conference finished with sightseeing day of Nagoya. 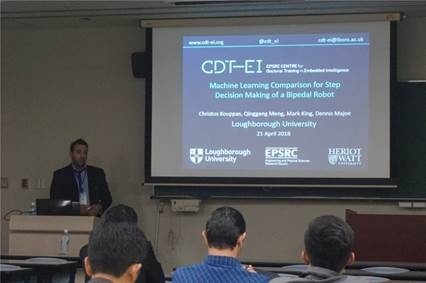 During the conference, Christos, presented his work on Machine Learning Comparison for Step Decision Making of Bipedal Robot. In his paper he compared different classical and neural classifiers. His results showed a clear advantage of neural networks with memory for continues systems like a robot. Those results will be used as his ground knowledge for his PhD. Additionally, Christos won the award of the best oral presentation in its session with title “Robot System Design and Path Planning”. The Construction Equipment Association (CEA) held an Innovation Is Here event at One Great George Street, Westminster. Several companies had displays at a mini exhibition such as Nylacast, KHL and Perkins. There was also a huge library owned by the Institute of Civil Engineers even containing a Lego tower bridge (to engage younger, and also older, audiences with civil engineering). The event was sponsored by JCB and Perkins. The reason for visiting was to develop an understanding of the industry position with regards to AI. The conference was moderated by Nick Higham (BBC broadcaster and journalist) who spoke about the need for the civil industry to move with the times with technology such as Industry 4.0, Internet of things and automation. The issue that Duncan discussed was the need for energy, and focused particularly on how dependent we were on it. This then led to why we still needed Diesel engines and suggested that electric was not yet ready for the demand (this would create an interesting discussion between themselves and Volvo, who were looking at electric technology). Duncan also spoke passionately about climate change and energy, with some good examples on Diesel vs electric cars. The key lesson from that using a basic energy equation could still highlight fundamental issues (such as the required overloading needed to supply a motor power, the amount of battery needed etc). Air quality was then discussed, focused on particulates. 25-100 micrometers was the harmful range that Perkins needed to address and they presented their latest technology using Diesel Particulate Filters and a a Diesel Exhaust Fluid which reduced particulate emissions by 98%. Finally, Duncan spoke about the Future of Fuels. He mentioned that in a review paper that 76% of industry leaders believed that hydrogen was the Future, however this was contradicted when further discussions with these leaders yielded concerns for packaging hydrogen and creating an infrastructure, similar issues to electric. This was also supported by a conversation he had with Prof Garner at Loughborough University. In particular, Rob focused on the importance of data, using famous case studies such as Uber and Airbnb to highlight how industries make money by selling a service, not a product. The next talk was from Dale Hawkins and Mark Kennedy (UK Plant Operators) titled A View from the Cab - Augmented Reality training. This talk was particularly well received as it addressed a key issue in the industry; young people not going into civil engineering, particularly machine operating. The average age of a plant operator is 54 in the UK and companies were struggling to train up enough young drivers to meet demand. Mark then presented one solution; an AR cab setup to help train drivers in a safe environment whilst also engaging a younger “gaming” generation. This was a popular talk and several people were keen to try out the simulator. After lunch, Inma Martinez (Deep Science Ventures, Innovator and Data Scientist) gave an insightful talk titled The Future is Now. She spoke about technology trends within information management and gave an overview on the various types on machine learning. It was encouraging to see that Inma spoke highly of Reinforcement Learning. Inma also discussed on of their projects; Blockchain. Inma also discussed about various data-mining methods and spoke about HPC methods and Exascaling (the reduction of data for useable scales) .This is a continually growing list of data that is secured by cryptography. What was also amazing to learn was that she was one of the pioneers of the internet, developing her work at CERN and has been involved with several projects, including helping to develop the first AI for mobile personalisation. The final talk was from Jenny Elfsberg (Volvo CE, Director of Emerging Technologies) one Does the Construction Industry Need Innovation? The Journey from Manual to Autonomous Equipment. Jenny demonstrated Volvo’s current autonomous technology; an electric dump-truck and a hybrid loader. Jenny then went on to discuss the reasoning behind choosing electric, stating that one of the advantages was the simplicity. In a quarry environment, it could be relatively easy to establish a charging infrastructure because it is a smaller, contained environment. Electrification was also shown to be valuable from a Value Stream Mapping perspective, which aims to highlight waste within a system. The two biggest causes of waste energy were within the hydraulics (12%) and energy losses from the Diesel engine (63%). Because of this, electric energy was investigated where Volvo stated that this loss could be removed with electric hence their switch. Jenny then started explaining the journey needed to go towards full autonomy, comparing it to what Volvo had already developed. 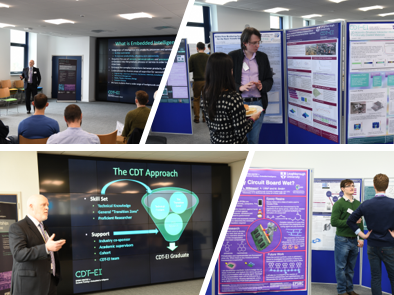 On 13 April Loughborough University hosted an Industry Open Day to promote the work of our researchers and opportunities for collaboration. Representatives from a range of companies attended the event from SMEs and large organisations with interests spanning smart manufacturing, AI, sensing and data analytics to name but a few. During the afternoon attendees were given tours of research facilities on campus covering Loughborough University Centre for Autonomous Systems (LUCAS), Sports Technology Institute, Vision, Autonomous and Human-Computer Systems Research, Building Performance Laboratories and Embedded Integrated Intelligent Systems research. I attended the conference on 14th and 15th March-2018 at the IET Austin Court Birmingham. This 2-days conference was an excellent opportunity to learn about recent progresses in the field of tribology. The keynote speakers were well-famous tribologist from universities and industries. In addition to those there were quite interesting poster talks from PhD students from various universities. This conference had various talks ranging from lubricant additives, friction, wear and coating technologies. In-situ measuring techniques to measure wear in tribometers by gathering online topographical data was interesting experimental procedure. and topography was quite interesting. Conversations with several speakers also directed me to further literature review that will make me think of new aspect of current research. It was also good opportunity to get in touch with my industrial sponsor.